Project Ember is our flagship amplifier that can power virtually any headphone available and power them with authority. The audio community is as excited as we are seeing Ember discussions and reviews pop up on all sorts of forums globally. She has even proven herself to power the hard to drive HE-6 and K1000 without issue per their owners. This is a pretty good feeling as we know we have nailed it on our part. Some of the discussions have a little bit of miss-information so we thought we would take the chance to address some of it prior to shipments going out late this week and also talk a bit about Ember. Ember cannot roll opamps. I think this confusion came from our Project Starlight amplifier which can in fact roll many opamps. The output stages on Ember are reflow soldered to the PCB and cannot be rolled. They are mounted this way for part of our thermal - cooling solution which works very well. Trust me, they are perfect for Ember. To further push the point, normal opamps CANNOT handle the voltages Ember runs at - so do not attempt to change them! Another topic has been output power. Bottom line, Ember has it in spades at USABLE headphone impedances. Ever notice how many manufacturers make blanket statements such as (3 or 4W output!) or other large numbers? Then they toss in the mix (at 4 or 8ohm or other wonky values which 99% of headphones are NOT)... Then to top it off they never reveal their amplifiers actual output - they just use the single largest value they can squeak out? Yeah that is irritating because they do not want you to know (just focus on the large number Mr. Consumer... as they waive their hands using jedi mind tricks) That is called deceptive marketing. In this example everyone thinks that have a 3-4W amplifier! Well... not really if used in the real world. Depending on your headphones impedance rating, you could be getting a small fraction of that power. 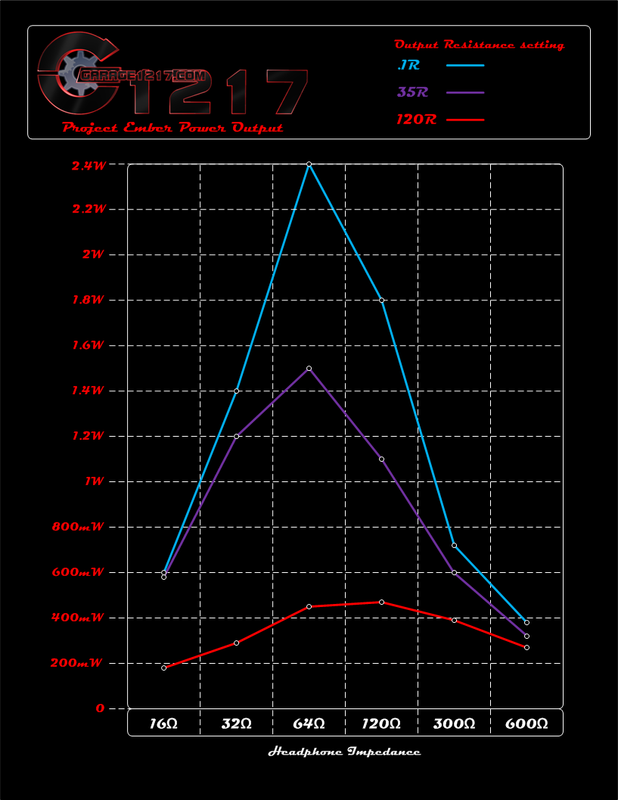 That is why every single amplifier we design, we clearly give power specifications at different impedance ranges and tell you flat out what ranges you should use the amplifier with. Ember was designed to power the majority of headphones you could choose from - covering 32-600ohm. And in the more common 32-300ohm range, she has enough to shred most headphones and your eardrums. For headphone use, she is very powerful and can turn at least all the headphones I own into desktop speakers. Why so much power? Some headphones cannot make use of it all clearly, but for power hungry Planar Magnetic's - Ember is your ticket! And for headphones that need headroom, headroom you shall have! Love to EQ? Have no fear, Ember will back up the bass region with power in spades. In short, you will NOT be left wanting. Power output chart is on the left btw. O.K. power is great, so what... how does she sound? Anything I say will make me sound like a bad salesman as I really am terrible in that aspect. Especially with all of the audiophile jargon that is tossed about and I will probably get made fun of while making up some descriptive words. In short, she is outstanding and the features can help you set her up to be anything you want from a headphone amplifier, tube buffer - pre-amplifier. In fact, there is nothing like Ember available with the features we offer. This is one hell of an amplifier. Ember is supposed to have auto bias, be able to change heater voltages by simply plugging in a tube AND let you roll in a very wide range of dual triodes. She also slices, dices and makes julienne fries! Wow that sounds like a dream or lie... Oh wait... yes Ember actually does all of that... except the fries part. Talk about making tube rolling easy. Ember has tuning options? You mean G1217 does not dictate what you are supposed to like? Ember, like all of our amplifiers, benefits from multiple personalities. Can any two sound the same? Absolutley, if you set them up the same and use the same tube. However, us telling you what you should should like or want in an amplifier is not what we do. We give you a wide range of tuning options to let you easily tweak the amplifier to what you prefer and the tube choices are vast. The end result is everyone likes something a little different depending on their equipment and preferences. These tuning options help to, or do elimitate the (this amplifier does not have synergy with X equipement) syndrome. Why is Ember not fully enclosed in an exotic crystal case with exotic, hand carved wood side panels from a country which does not officially exist? And why is the volume knob not spun from pure unobtanium by a tribe of beautiful virgin blacksmiths found deep in the Amazon? Really? Some audiophiles... HA! A tribe of beautiful virgin blacksmiths from the Amazon... kidding - we cancelled that option as shipping was expensive and maintenance was high!